There are so many other cute stamps with this set and the coordinating FREE Digi Die Cuts make the stamping easy! 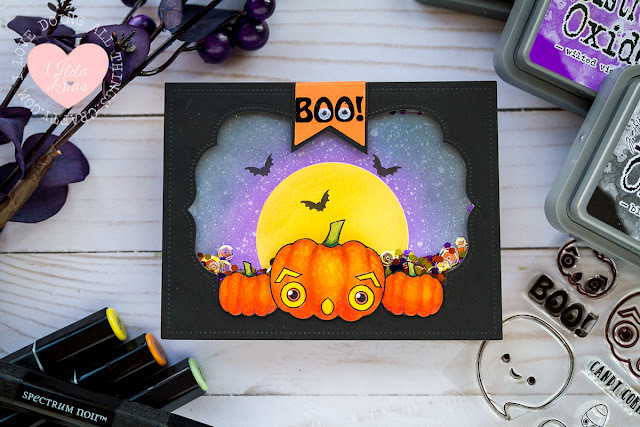 I had some fun using a bunch of my different colored embossing powders! This stamp doesn't necessarily have to be colored in, sometimes simple is good too! 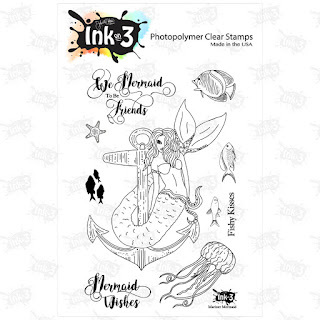 Thanks for stopping by to take a look and make sure to check out all the other great stamps at Ink On 3! 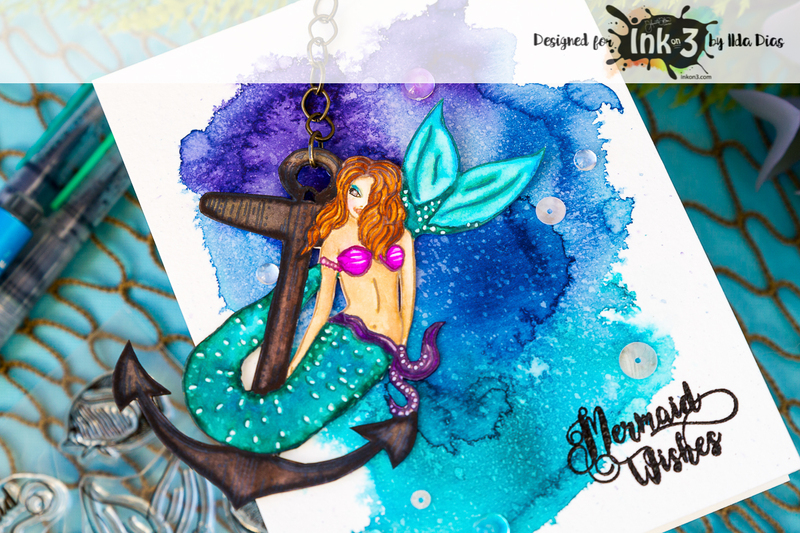 Hey everyone, I have a quick card to share with you today using the super cute mermaid image from Fleurette's last release. I'm a little late with this but better late than never! Life got crazy for a bit, lol. I used a die from my stash, Stamps Of Life I believe, and cut it from some watercolor paper. 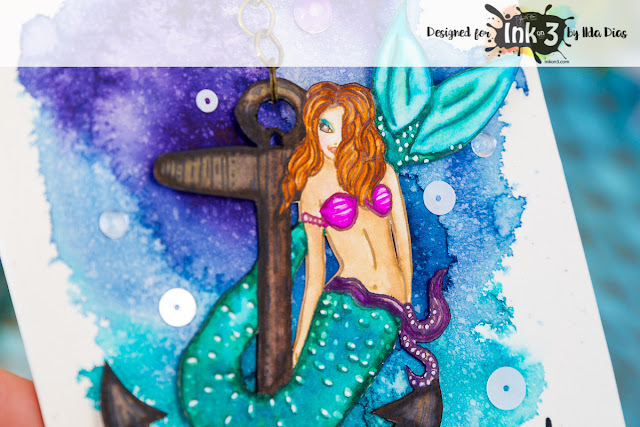 I then stamped the mermaid on the largest piece and several of the other elements onto the smaller pieces. I then went about to color them. I took the frame piece and smooshed VersaMark ink all over and embossed with silver embossing powder. I wanted it to look like metal. Instead of using acetate for my shaker window, I used tule. I've done this many times, as I find all my shaker bits stick so bad from static and I'm not a fan of that, lol! Plus, I like the texture it gives. I added all my shaker bits and adhered the frame to a white card base. I then took the other images I colored and glued them into the squares they came from. 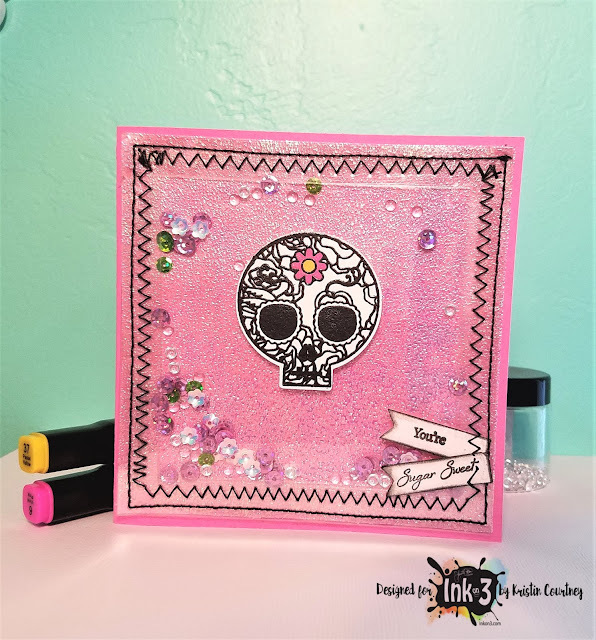 I stamped out the sentiment and embossed with silver embossing powder as well. I mounted it to a piece of white and then dimensional adhesive to the front of the card. I hope you got a bit of inspiration today. Keep watching as new things coming! 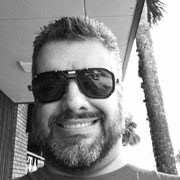 Another release just came out and I'm working on projects using those products. Cool stuff. You won't wanna miss it! Here's your links for shopping. Head on over, check out all the amazing stamp sets, and other crafting supplies. And don't miss the new release! 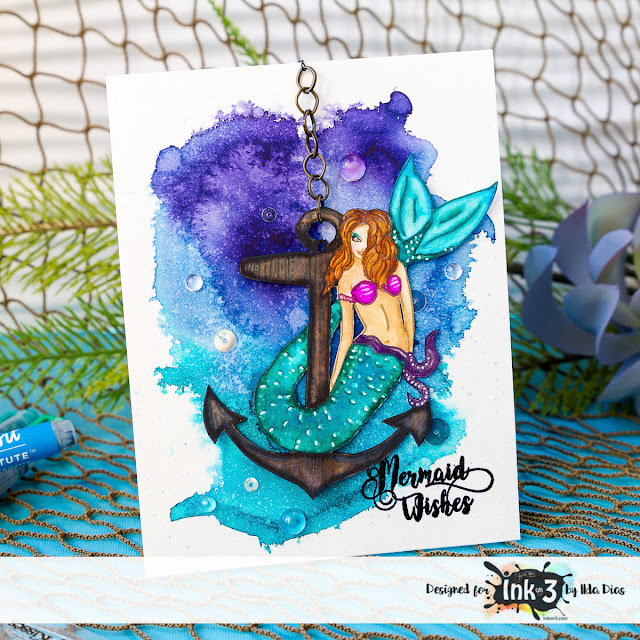 Today I have a really quick and simple friendship card to share with you featuring Ink On 3's Mariner Mermaid stamp set. For this card I used my Kuretake Gansai Tambi watercolors to create is beautiful water like background. 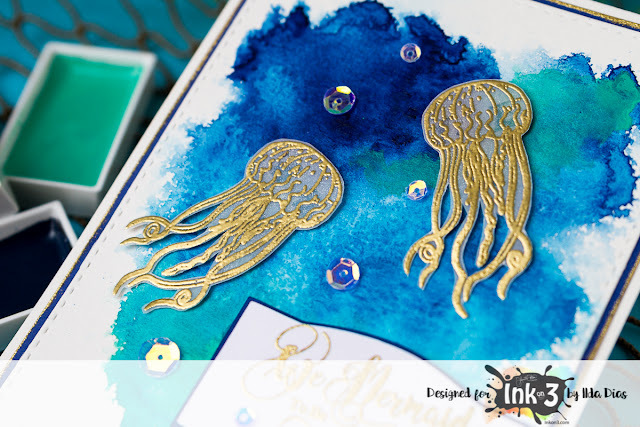 Next I stamped out my Jellyfish on vellum and embossed them using gold powder. 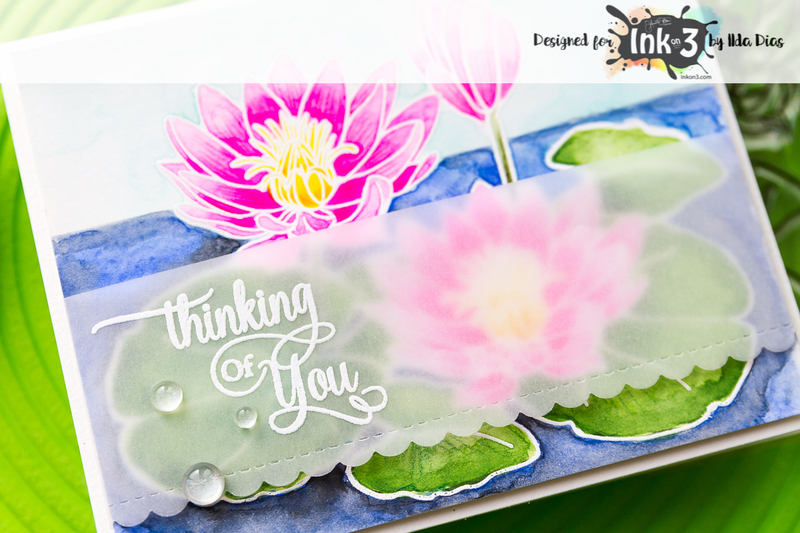 Then I fussy cut the images and attached them to the card front using some clear double sided glue pads. The rest of the card is pretty self explanatory and as you can see for an extra gold touch I added gold embossing powder along the edge to the blue layer of card stock. Hope this simple card design has inspired you today. Click→ HERE if you are interested in the supplies I used. Hello there! Today I am sharing a DT project with you for Ink On 3. Do you know anyone with a Birthday on Halloween? 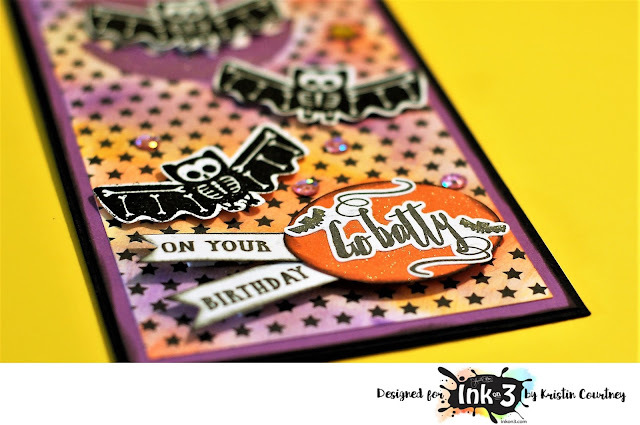 Combine the two with a card like this using Ink on 3's Go Batty stamp set. The bats are stamped with a VersaMark stamp pad and then embossed with black embossing powder. 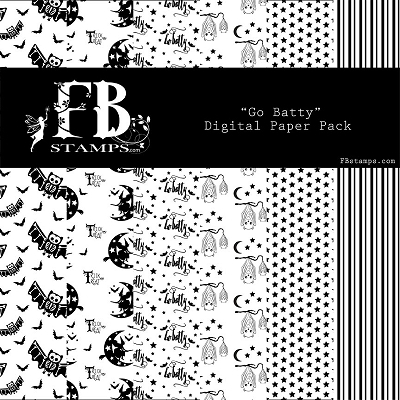 Make sure to use the Go Batty Digi Dies...it makes things so much easier! 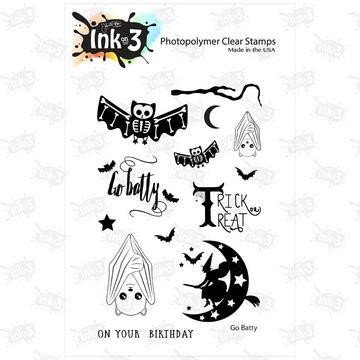 They are free with your stamp purchase! 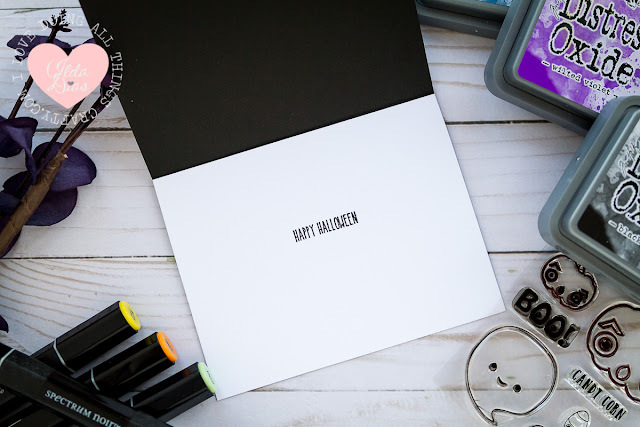 The background paper is printed using the Go Batty Digi Paper Pack. I used purple, orange and yellow ink to create the blended background. I used the Halloween Card Kit and sized it down to fit the bat from the stamp set. Foam pop dots add dimension to the bats. 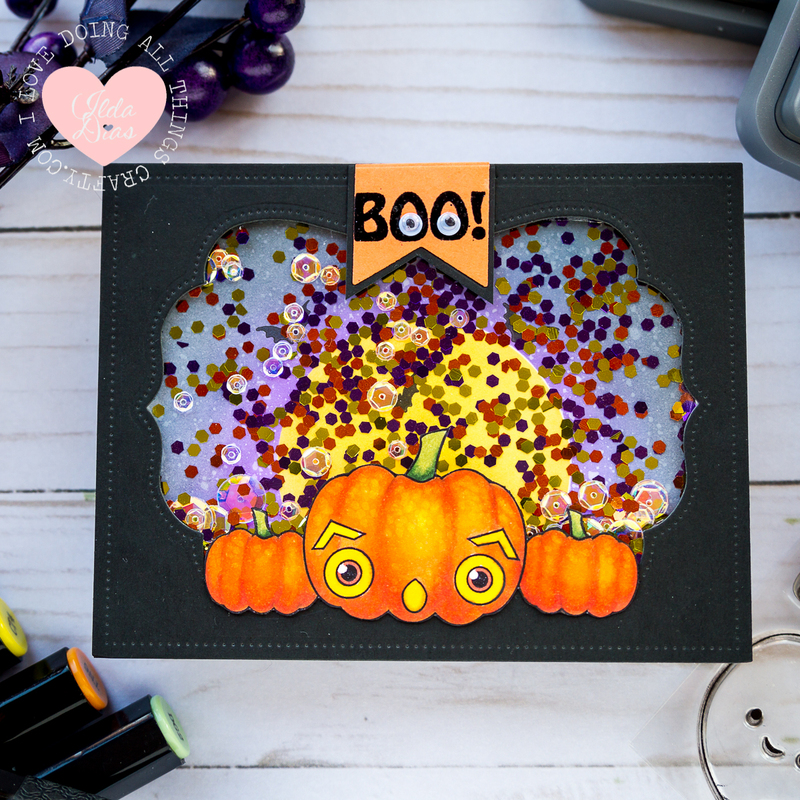 To add some shimmer and fun, I used sequins and a glitter pen. Have a great day and an even better day crafting! 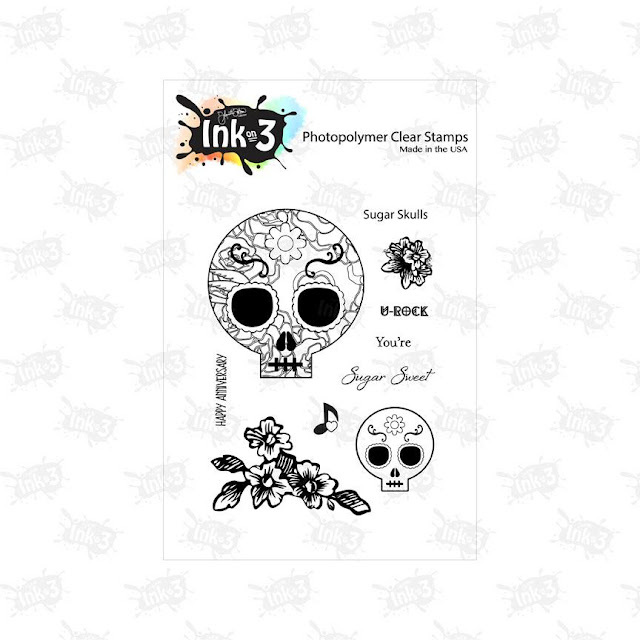 Hello, Ilda here... and I'm back again today with another DT project for Ink On 3. 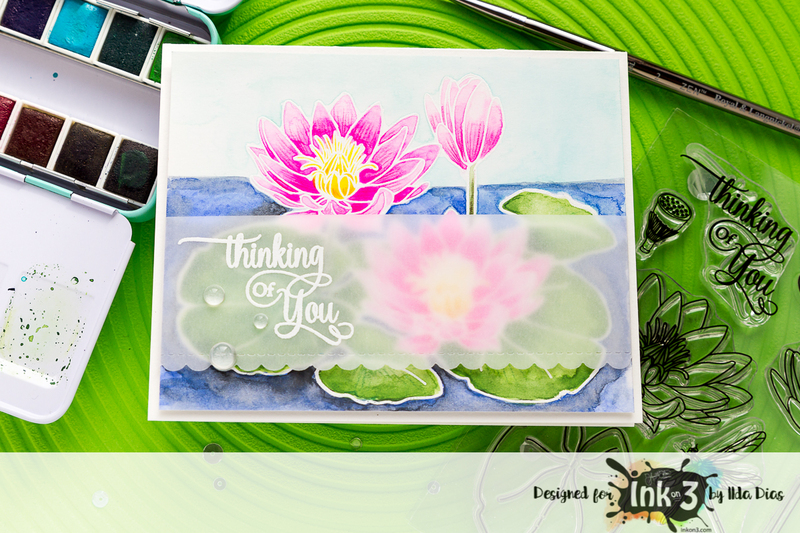 Hope you were inspired by today's Thinking of You Card featuring Ink On 3's Waterlily Stamp set. If you were and are looking to buy this set you can get it now on SALE for a limited time → HERE! 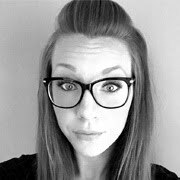 For a look at all the products I used check out the links at the bottom of my post → HERE. 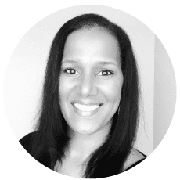 Hello friends, Ilda here again taking over Fleurette's Blog! To create the background I wet the paper and then lightly touched the wet areas with Jane Davenport Mermaid Markers. These colors are so vibrant a little goes a long way. Just before the area dried I then used my distress spray bottle to splash and spread the ink around. I repeated that a few times with different colors, using by heat tool to help speed up the drying process. Once the entire background was done and dry I sprayed the background again this time picking up the droplets with paper towel. Ilda here from the Ink on 3 DT!!! 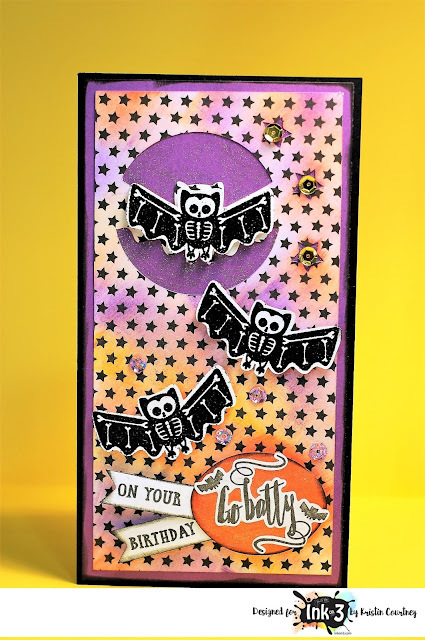 Today I have a fun Halloween Shaker card to share with you featuring a few stamps sets from Inkon3, formerly know as FB Stamps. Click here for links to supplies used. Plus check out the Special Bundle Prices for new release! 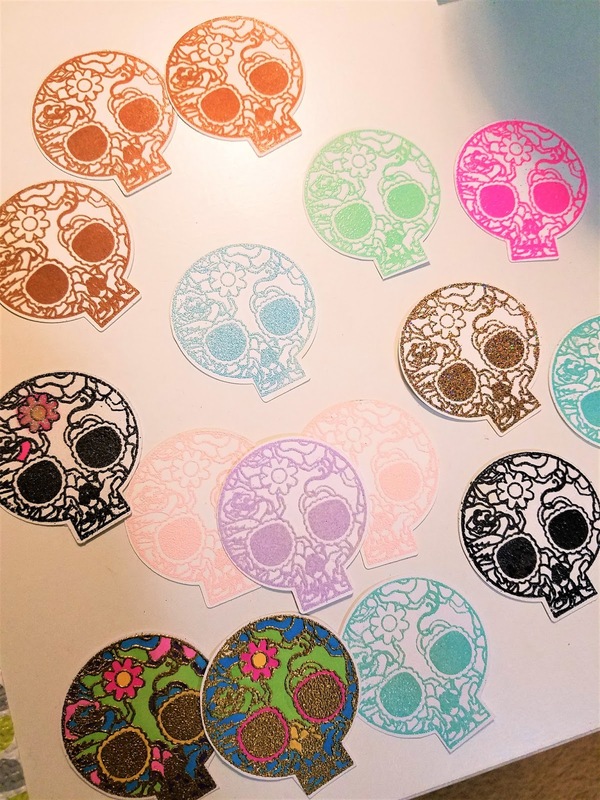 SVGs - Piecing Patterns with sizing and layering - All designed to work seamlessly with Cricut Explore, Silhouette Cameo & Portrait, Sizzix, Scan N Cut and other cutting machines. Amaze your friends with this gorgeous easy to create box card. *Immediately after purchase you will receive an email with a download link to your files. Files are SVGs and come in .zip format. Want to get even more creative! 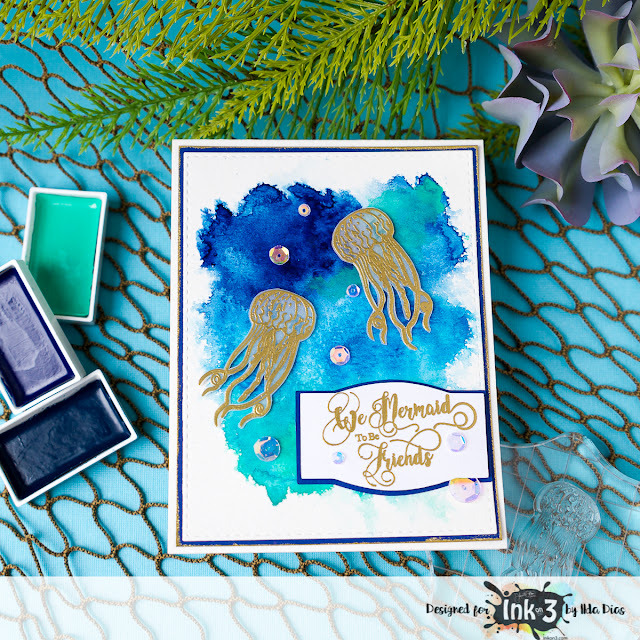 Combine it with our Mariner Mermaid Stamp Set as shown in the other photo. 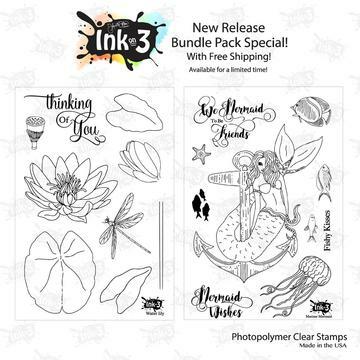 * Thank You stamp is from our "Roses In Bloom Stamp Set"
* Starfish and Fish are from our "Mariner Mermaid Stamp Set"
Coordinates beautifully with the new Ink On 3 Mariner Mermaid stamp set.